The list of survival gear that achieves the hallowed description “Damn Near Perfect” is short. An item that attains this sacred survival title needs to possess several attributes (or one damned good one) that play in harmonious concert with each other to create a product that will enhance your life with minimal hassle while you are ensconced in stress-inducing environments. 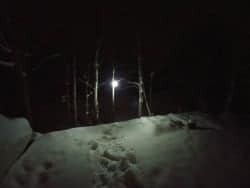 To that end, I hereby submit the addition of the Hybridlight PUC Solar LED Lantern to the annals of survival gear damn-near-perfection….and here’s why. Hybridlight has been making a name for itself producing rugged, high-quality outdoorsman/survival-oriented illuminating devices. The beauty of the products Hybridlight offers lies in their self-sustainability. You see, not only are Hybridlight flashlights, headlamps, and lanterns rechargeable via Micro USB port, but they also incorporate integrated solar panels that can top off the integral lithium-ion batteries. The icing on the cake is that most Hybridlight products also boast a standard USB port that you can use to charge other devices (even another Hybridlight product). While Hybridlight may not be the only company offering variations of such equipment, they are the company that produces the cleanest, most streamlined and well-thought-out products for their outdoors-oriented target audience. A quick perusal of their website will illuminate you as to the full breadth of Hybridlight’s product line – and it’s full of good stuff. Getting to brass tacks, The Hybridlight PUC is a compact lantern system that offers warm, diffused area lighting when opened and expanded, as well as focused, beam-type lighting when the PUC is collapsed and screwed shut. The design of the PUC utilizes an integral, non-removable lithium-ion 4,000 mAh battery (think over twice the battery capacity of an iPhone 7) to power its LED bulb. The battery will, according to Hybridlight, hold a charge for seven years (!) continuously. The older model that I have boasts 75 lumens of illumination at its highest power setting; however I have noticed on Amazon that there looks to be a newer 150-lumen offering that uses the same power sources, but a smaller 2,000 mAh battery. The “hybrid” portion of the moniker refers to its dual methods of charging its battery – the integrated solar panel, or the faster-charging, and water-resistant micro-USB port for direct charging from a wall-mounted or similar charger. Hybridlight thoughtfully includes a charging cord, but no wall charger – that end is on you. The two USB ports are protected from dust and water by a form-fitting rubber cover that stays put nicely and doesn’t pop off after repeated use. Three small indicator lights on the side of the PUC – between the USB ports and the simple rubber power button – show the level of charge in the battery, as well as the status of the current charging operation. A red light means the unit has access to light and is charging its battery. Green is full. Hybridlight claims that a full charge will allow 8 hours of continuous light at its highest, 75 lumen setting; up to 40 hours of illumination can be had if you can live with the lower output setting. A strobe function is also built into the Hybridlight for emergency signalling. When collapsed shut, the 7-ounce Hybridlight PUC isn’t much larger than a hockey puck, being but two inches thick. However, a simple ¼” twist-and-pull motion will open the PUC up like an accordion bellows, bringing it to its full, still-compact height of just under 5 ½”. The walls of the lantern are made of a tough white plastic that protect the LED bulb, yet diffuse the emanating bright light to cut down glare and eliminate hotspots. If you’ve ever spent any time around a Coleman lantern running at full tilt, you’ll know exactly what I’m talking about when I say that the glare reduction is a most welcome feature. 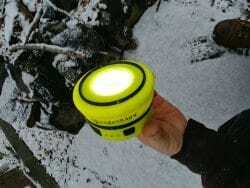 A plastic lens sits on the opposite side of the solar panel to offer that 75 lumens as a projected flashlight-type beam when the whole works is collapsed down and locked shut. A ridiculously tough, slightly grippy nuclear-yellow plastic exterior, a metal folding-away hanging hook and rubber “feet’ round out the list of standard options on the PUC. The unit is simple and clean, without a lot of silly options or unneeded accessories to detract from the PUC’s true purpose: to be an outstanding light source. The addition of a solar panel to a lantern is a modern, brilliant solution that has come into play since the coming of age of miniaturized, rechargeable lithium-ion batteries and efficient photovoltaic cells. The theory is simple and sound, and Hybridlight’s execution is splendid. 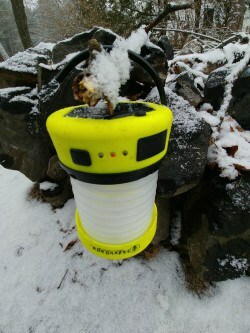 A simple hexagon-shaped solar panel is inset into one flat of the PUC, with four small rubber feet accompanying, to keep the light up off the solar panel when being used as a stand-up lantern. The panel surface is very rugged, with the panel on my example only exhibiting minor scratches after a year of very frequent use. Drops and slight impacts have had no negative effects on the panel or its charging abilities. Those abilities are activated automatically (no switch required) when the PUC is placed in sunlight. Obviously, the brighter the ambient sunlight, the faster the PUC recharges. While I don’t believe I’ve ever attained a full charge on sunlight (it takes several hours), I have yet to have the Hybridlight PUC run out of illumination juice – even when left on overnight for a nightlight or camp lamp. Plunking the PUC in the sunlight for most of the day seems to build up ample charge to power the light all night. Of course, with the utilization of the Micro USB port, you can top off the batteries to ensure you’re leaving the house with a full charge for that extra warm ‘n’ fuzzy. 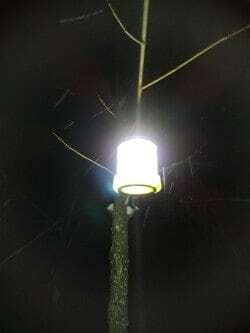 On a recent wind-caused multi-day power outage here in Southern Maine, the Hybridlight PUC performed admirably, providing light for the whole family’s bathroom trips, living room reading, and outdoors excursions, while also performing double duty as a cellphone charger – and the PUC always had enough left over for all our light needs. Seriously impressive. Using the USB charging feature is as simple as plugging in your USB cable to the two devices. During the aforementioned windstorm outage, the PUC happily supplied my family’s Android and Apple devices with enough juice to keep up to date on the weather or text friends. The PUC seemed to dole out the power at about 1% per minute or so (or 30% per half hour) on my wife’s iPhone 6S. Without daylight to top off the PUC’s batteries, the PUC will cut off the power to the charging function once it reaches 20% battery charge level. The remaining 20% is held in reserve so that the PUC will be able to provide illumination for some time before it can be charged again. A teenager with their face constantly buried in a phone will be unhappy about the rate of charging and power supply of the PUC, but really, I was just fine with that. Maybe they’ll read a book and learn something once they get tired of whining. In reality, the PUC isn’t meant to be a high-volume charging station to keep a gamer happy; it’s at its best topping off a charge while on a hunting lunch break in the woods or when the power goes out. Without a shred of hyperbole, I can look you straight in the eye and say that the Hybridlight PUC has revolutionized my portable light usage. No longer do I need to pack out a delicate and bulky Coleman lantern, with its frail mantles and extremely flammable fuel sources. 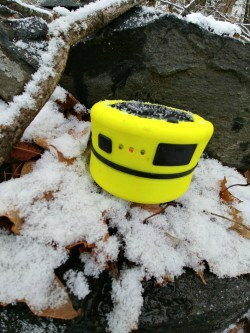 Fifteen pounds of light and fuel has been replaced by a little 7-ounce collapsible yellow lantern. Camping with my young son? No worries on leaving him with a flashlight that burns up expensive batteries. Power outages? The Hybridlight PUC provides light at night for the whole family room for reading or board games – open flame candles not required. When performing nighttime or dark-area repairs on my vehicles, I don’t need to haul around a drop light that gets hot and lives off of extension cords; the PUC can hang off anything a drop light would. If it falls onto asphalt or concrete, it bounces instead of shatters. When I’m done with the PUC, I close it and place it solar panel up on a windowsill or dashboard for easy, no-brainer charging as the day goes on. With the PUC, Hybridlight has eliminated the need for many different light sources around camp and around the house. While white gas or propane lanterns are still viable (and necessary!) illumination sources for the survivalist (I’m not sure how EMP-proof the PUC is…), the PUC requires no resources except sunlight, and it can provide power to charge cellphones, tablets, walkie-talkies, or other items you might deem essential in your life. Buy a $35 PUC for each member of the family, and save the fuels to power heaters and stoves. Again, without exaggeration or paid-off confidence, I can tell you that the Hybridlight PUC is a game-changer if you ever plan on experiencing darkness – and from what I hear, most of us probably will. The PUC is, as I said, damn near perfect – and everyone ought to have one or ten. 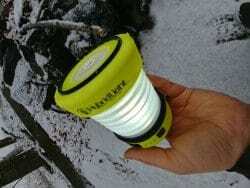 I dare you to make the minor investment on one and NOT sing its praises to your fellow man – especially when the power is nowhere to be found and you’re reading Survival Cache articles on your iPhone while basking in the glow of your solar-powered lantern.